One of the most satisfying parts of the body to condition is the chest. It’s a big series of muscles, and getting it in shape can make for an attractive part of the human body. Unfortunately, many “old-school” fitness clubs will train clients with traditional bench-pressing done with heavy weights. Lowering heavy weight all the way down to your chest stretches and places a great deal of strain on your shoulders, while simultaneously forcing them beyond their normal range of motion. This is almost sure to cause injury. Fortunately, there are much safer, and more effective ways to workout your chest. The following exercises and their variations can be used in a lot of combinations to ensure that you get the chest you’re looking for. But before you do anything, warming up with stretches is always advised, and make sure that you properly cool down after your killer chest workout. Before any machines or weights are introduced into this equation, the chest can be trained without using any weights at all. Two exercises that are perfect for weightless training include dips and pushups. 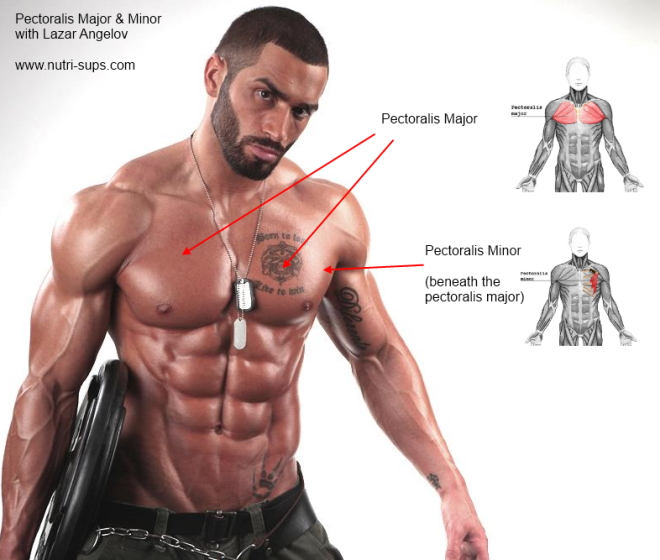 While these exercises don’t completely isolate the chest muscles because they also work other muscles like the shoulders and triceps, they are an extremely effective and convenient way to workout the chest. Dips require two horizontal bars approximately shoulder width apart and a few feet off the ground. Place your hands approximately shoulder width apart on the bars, bend your knees and suspend yourself in the air. From here, you simply lower yourself until you armpits are approximately level with your hands. Then you push to return yourself to the “up” position. For a bit of variety, you can change the position of your hands or your incline to work various parts of the chest. Pushups, perhaps the oldest exercise in existence for the chest, requires you to lie flat on your stomach. Place your hands approximately shoulder width apart, and while on your toes, you push yourself from the down position to the up position, all the while keeping your body in a straight line. For more intensive conditioning, try to go down to the floor as far as possible. If you like weights, forgo the traditional bench press, and try a great chest exercise called the nautilus butterfly. This particular exercise isolates the chest muscles and is as easy as sitting in a chair. You simply place your arms comfortably on the pads of a nautilus machine and push your elbows together to lift the designated weight. Start at a moderate weight, and then move to a weight that is more challenging. An additional tip with this exercise is to pause for a moment while your elbows are together. As with the dips and the pushups, you can vary the incline of the chair and the placement of your hands to work different portions of the chest. Make sure that you use controlled motions and breath properly throughout the routine. Another similar exercise, but with substantially more options, is the use of crossed cables. Find a machine with two cables facing each other. Place the hand grips on both sides, and clear the middle of it. You should also move the cable pulleys to the top so the weight is lifted when the cable handle is pulled down. Taking a standing stance in the middle with your feet approximately shoulder width apart, gripping both hand grips, draw the handles down in front of you and cross them over and approximately waist level. Make sure that you return them to the starting position using controlled motion, not allowing them to slam down or snap back. Finally, while the traditional bench press may cause injury, the decline press is a much safer alternative, and easier on the shoulders. The decline press targets your lower chest. Simply lie on a decline bench and hook your lower shins under the padded supports. Hold dumbbells straight above you with your palms facing your feet and the weights an inch apart. Slowly lower the weights down until your elbows are bent 90-degrees. The dumbbells should be about level with your ribcage at this point. Push the weights back up and repeat. Using these simple chest exercises, you can build virtually any chest you want. Just find the exercises you like, create a simple schedule, and stick to it. In no time, you’ll get where you want to be, but remember to take two days off in between workouts to promote a full recovery.